Look no further than San Francisco for a great casual date place or a gathering of friends. 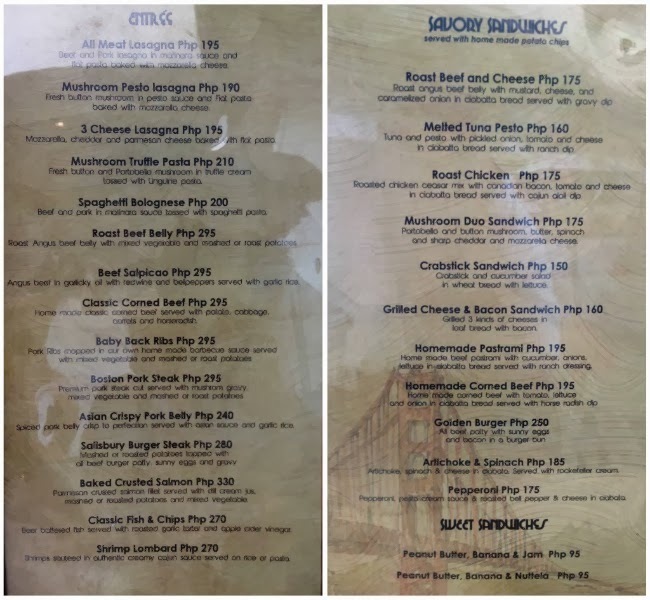 I'm talking about SF Bistro, short for San Francisco Bistro located at the Tuscany in McKinley Hill. 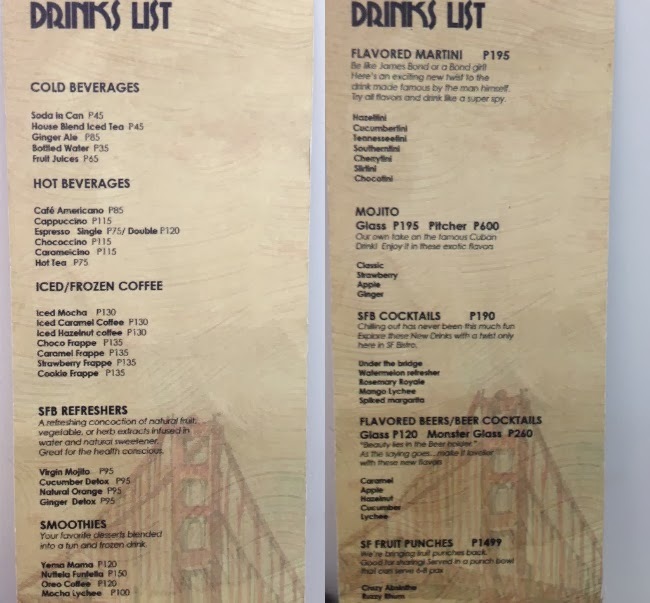 SF Bistro is a great casual dining place that serves affordable comfort food and a wide assortment of both alcoholic and non-alcoholic beverages. What probably made my visit more pleasant was its element of surprise which I would also like you to experience in this review. For that reason, let's try a sort of game wherein I talk about the dishes and you guess how much they cost. Will disclose menu at the end of the post. Ready? The sweet ones...part of SF Bistro's Smoothie line-up...L: Nutella Funtella, R: Yema Mama. Both are a bit too sweet for my liking but I was never really fan of Fraps and such but according to my friends, they're a must try for the sweet-toothed set. SFB Refreshers in Cucumber Detox and Ginger Detox. Refreshers being the operative word because nothing can quite be as refreshing as these. The Ginger Detox is also a really good hangover cure. Starters...Buffalo Chicken Fingers...generous servings of tender wings in a hot and sweet sauce. Mushroom Truffle Pasta - truffle and reasonably priced don't normally mix well but here, they do. The flavor of truffle in this pasta dish is distinct yet not too overpowering just like the consistency of its sauce. It's neither thick nor runny. Just right and perfect with the al dente linguine that accompanies it. Greek Salad - big enough to share with hefty servings of olives, walnuts and feta cheese in a balsamic dressing. Yum. Baby Back Ribs - one of the favorites of the day and something I'm pretty sure you'll be coming back for often. Marinade is a perfectly seasoned barbecue sauce and meat just falls off the bone. No need for knives here but maybe an extra side order of rice should be in order. Baked Crusted Salmon - I don't normally order Salmon unless it's raw. I find its meat a little too rich but the crust/breading on this one takes the umay factor away and turns every bite into a fishy delight! (rhyming! :P) The cream jus that accompanies it is also superb. Make sure to ask for more. 3 Cheese Lasagna - must order for all the cheese lovers and vegetarians out there (who are not lacto-ovo...Ana this is calling out your name). This 3 cheese lasagna is oozing with mozzarella, cheddar and parmesan. 'Nuff said. Our level of dedication as demonstrated by Tracy and the menu!